Tall, deciduous shrub; stems 1-3 m tall, punky, thick, strongly armed with yellow spines 5-10 mm long. Palmately lobed, the leaf blades shallowly 7- to 9-lobed, 10-35 cm wide, heart-shaped at the base. Inflorescence of small, headlike umbels in elongate panicles or racemes, up to 25 cm long; flowers greenish-white, short-stalked. Bright red berries, 2-3 seeded, 5-8 mm wide. Wet to moist streambanks and forests in the lowland to subalpine zones; common throughout all but NE BC; N to SW AK and YT, E to AB and S to MT and OR; disjunct in ON and MI. A shade-tolerant, submontane to subalpine, Asian and North American deciduous shrub distributed equally in the Pacific, Cordilleran, and Central regions. Occurs on very moist to wet, nitrogen-rich soils within boreal, cool temperate, and cool mesothermal climates; its occurrence increases with increasing precipitation and continentality. Common, often dominant. in semi-open forests on water-receiving (floodplain, seepage, and stream-edge) and water-collecting sites; occasional on water­shedding sites when soils are calcareous. 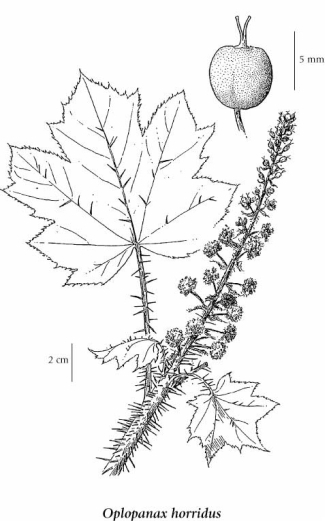 Typically associated with ferns (Athyrium filix-femina, Gymnocarpium dryopteris, and Polystichum munitum) and forbs (Actaea rubra, Galium triflorum, Tiarella trifoliata, and T. unifoliata). A nitrophytic species characteristic of Moder and Mull humus forms.